Tom Derickx has announced his retirement from AFL football. Following the retirements of Ted Richards and Ben McGlynn, the Sydney Swans have made another two changes to their playing list. Ruckman Tom Derickx has retired while rookie Kyle Galloway has been delisted. Derickx, 28, joined the Swans from Richmond at the end of 2013 as a delisted free agent. 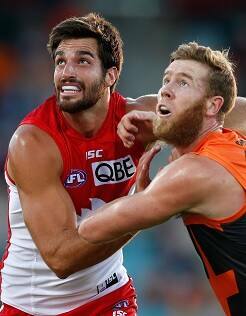 He made his debut for the Swans in Round 2, 2014 and played a further 12 games in red and white. Galloway was recruited as a Category B Rookie from Deniliquin in country NSW and played in the NEAFL this season. Sydney Swans Head of Football Tom Harley has thanked Derickx and Galloway for their contribution.